Type: Books, For Sale - Private. 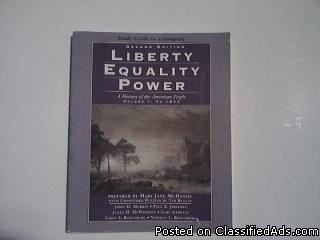 Liberty Equality Power A History of the American People Volume 1 : To 1877 is a study Guide workbook. Theres little wear, and tear to the book cover . Pages all intact and in good condition. On your money order's, please make sure that you include your correct mailing address, item description, and item ID with the money order. The address you provide is where your item will be sent. Once you have bought an item , I will contact you via your E-mail and give you the address to send your payment to. Sorry only Money orders .Sales are final and no returns.